On Wednesday, March 27, 2019, Chisholm Academy’s Grade 10 students were hard at work completing the Ontario Secondary School Literacy Test (OSSLT). 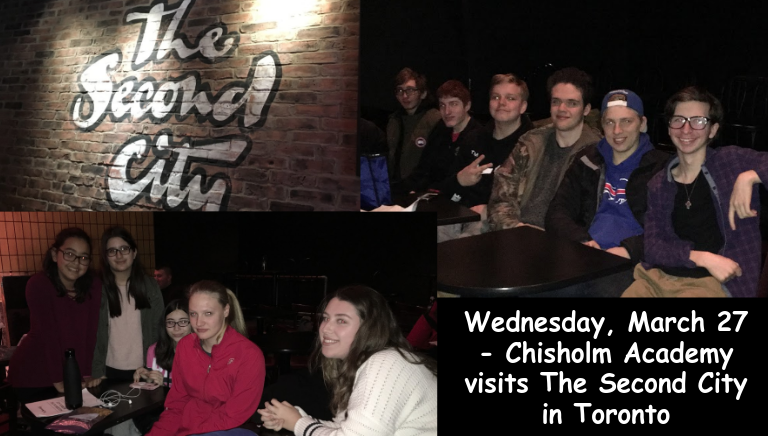 Meanwhile, the remainder of the Grades 6-12 student body developed their communication skills in an interactive and creative way at Second City in Toronto. In the morning, our students took part in interactive, improv-based workshops facilitated by Second City’s professional actor-instructors. The Grade 6-8 students focused on building Verbal and Non-Verbal Communication Skills, and the Grade 9-12 students focused on Utilizing Effective Communication for Success in the Workplace. Following a lunch break, our students enjoyed an engaging performance, during which Second City cast members let their improv skills shine. Our students were even invited up onto the stage from the audience, to assist the cast in their improv skits! Thanks to Adam, Jackson, Travis, Mark and Sam for their assistance on stage!